Seconds out! Join the Moss Side Fire Station boxing club for their open air boxing show. Community groups are what we are all about. Moss Side Fire Station is home to a collection of local amateur boxers of all ability, ethnicity, age and gender. 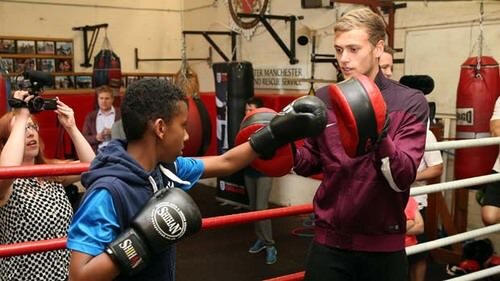 Forever Manchester helped to fund the boxing club after Nigel Travis, a local fire-fighter and actor, found that there was an empty space at the fire station. His vision was to change that emptiness into a place where boxers, young or old, could come together and build a community. That was back in 2009 and since then the club has been endorsed by pro boxers like David Haye, Ricky Hatton and Amir Khan. Only last month one of their own boxers, Conner Tudsbury won the English Boxing Junior ABA Championships. An amateur boxing card will be there on the night for your entertainment. It will give local folk an idea of what you can expect from a boxing club and how you can get involved. The Open Air Boxing Show will take place Saturday, June 11 from 12:00pm-5:00pm at Moss Side Fire Station Boxing Club. Tickets are FREE for everyone. Just come on down to the Moss Side Fire Station and you’ll be looked after. Tell them Forever Manchester set you down.